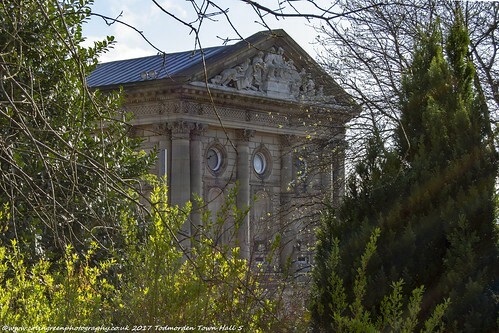 Colin Green Photography: Todmorden Town Hall. 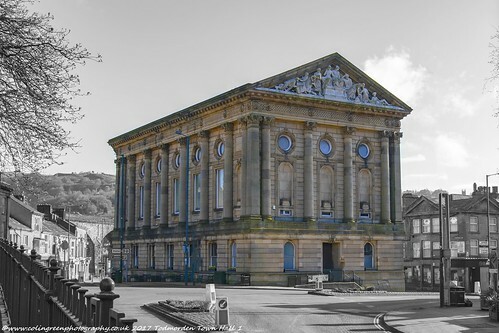 Todmorden Town Hall is a neo-classical Grade I listed building. Building work commenced in 1860 and the hall went through many changes with architect James Green being the original designer, work stooped in the 1860's due to legal and financial problems, before the Fielden family purchased the land and hall in January 1866 at auction. John Gibson of Westminster was then appointed to redesign the building which was completed and opened on 3rd April 1875 at a cost of £54,000. The building was built across the Lancashire - Yorkshire county boundary to help unite the rivalries, although this boundary was moved on the 1st January 1888, bringing the hall and the town of Todmorden within the Yorkshire county fully. This small collection of 6 pictures was taken on April 22 2017 using a Nikon d3300 SLR camera. 2 are exclusive to Clickasnap via the link below, with 4 available here and on Flickr. Click here to view Todmorden Town Hall on Clickasnap. Click here to view Todmorden Town Hall from St Mary's Churchyard on Clickasnap.